Highly recommended dystopian reading; intellectual heroic fantasy that unfolds fast furious . Carl Sagan's The Demon-Haunted World: Science as a Candle in the Dark inspired this Slaves of Erafor series (a dark muse for sure). When and how should passive intellectuals fight back against blind oppression? It is a timely philosophical question for many, especially in a day in which faux news is eroding our confidence in society's collective intelligence. At what point is violent revolution warranted? Rhein offers an entertaining adventure that invites us to consider such dilemmas. Don't worry, it reads as fun escapism--not a manifesto. 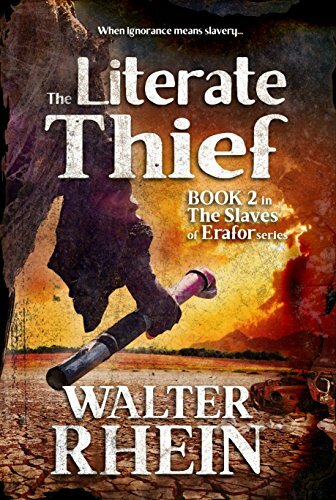 This is a stunning sequel to the The Reader of Acheron, which introduced us to Kikkan (an educated brute, a freed slave--he's the pipe-wielding dude on the cover) and the duo of Cole & Quillion (nuanced mercenaries). The three men go on a mission, inspired by a rare scholar named Lockhart: find a teacher, a literate thief, in Edentown. They are continuously dogged by an oppressive, illiterate government. Acheron was ambitious and rewarding, introducing us to a future in which reading is prohibited; Thief is even better. Stylistically, the Literate Thief is very realistic (no mythological monsters or contraptions exist) but it does "feel like" Steampunk Fantasy. Its tone is more Grim than Hopeful, but that reflects the daunting conflict our heroes face. Its faces several humans against (a) organized authoritarian government, (b) a drugged, apathetic populace, and (c) an impoverished ruined city-scape. There are several instances you will hope that they can escape into the infested, haunted subway for relative safety from the dangers above. Walter Rhein mixed up just the right number of opposing & cooperative players and places. As much as the Literate Thief fleshes out the World of Erafor, it opens up new vistas into weird science (futuristic alchemy & drug use) while exposing more mysteries. One the one hand, the geography crystallized: places like: San Borja, San Aryan, Brinewater, and Edentown all became distinctive characters unto themselves; on the other hand, characters like Quillion, Cole, and Kikkan demonstrate wild heroics while revealing more about themselves... and new people (i.e., the antagonists Orion and Janus, and the roving library-scholar) offer up an atlas full of new stories. There is a thief of course: Simyon, a friend of the seductive archer Valeria; they make a great pair. But is Simyon the titular Thief? Drugs play a prominent role. First there is Bliss, that is voluntary, and involuntary, imbibed by the abundant, lower classes; these addicts become so consumed they resemble mindless, cannibalistic demons. There is also an unnamed steroid-like substance the governing brutes consume, which may be harvested from the humans they torment. The Slaves of Erafor is an unfinished series, so don't expect all mysteries to be explained. I haven't felt the giddy need to read the next book (in progress) since I was a teenager devouring series like Raymond E. Feist's Riftwar or Margaret Weis's Dragonlance.